The Crystal River on Sept. 18, 2018. Photo by John Herrick. At the head of the Crystal Valley, automated sprinklers trundle across fields that hug Highway 133, scattering precious water over green sprouts. But on Brook Levan’s farm, one of those sprinklers sits idle. Due to low flows in the Crystal River, the irrigation system stopped operating. Levan had to purchase organic hay from out of state to feed his dairy cows. “Some of that’s Montana water,” said Levan, pointing to a shed filled with bales of yellow hay. 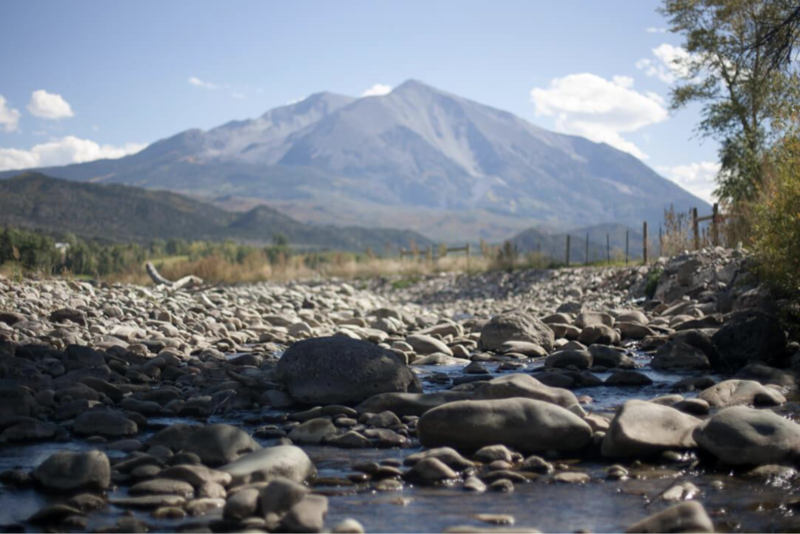 Levan, director of Sustainable Settings, a nonprofit that promotes sustainable farming, said he remembers when there was snow year-round on Mount Sopris. This year, the mountain’s dry and gray. In the valley below, the Crystal River flows at a trickle, meandering through a rocky, dry riverbed as warm winds whip across the fields at either side. For Coloradans in state Senate District 5, an area larger than New Hampshire stretching from the Vail mountains to the western plains, water is a constant worry. It helps grow fruit for markets and hay for livestock. It sustains recreational economies that rely on visitors who ski, raft and fish. Some call water the state’s lifeblood, and that’s doubly true in water-dependent Crystal Valley. And as the rivers run dry and reservoirs run out, two candidates vying to represent this district in the Colorado Statehouse are proposing different paths forward for how to manage the state’s water supplies — and the public lands that encompass them more generally. The incumbent wants farmers to be allowed to lease their water rights without fear of penalty, while her opponent believes building reservoirs to store water is the best answer. Republican Olen Lund, a 59-year-old alfalfa farmer from Paonia, is running to unseat Democratic Sen. Kerry Donovan, a 39-year-old rancher from Vail. The winner will likely play a role in the contentious debate over water policy, especially as Colorado braces for increasing demands from other states on Colorado River water. For Dea Jacobson, a former regional campaign coordinator for the Democratic Party from Cedaredge, the environmental impact of oil and gas drilling is an even larger concern. “The region needs nursing and care,” she said, especially when it comes to proposed drilling in the North Fork Valley. “Putting the oil and gas industry in the same backyard as the water supply needed for organic farming” is dangerous, she said. Water is paramount in this district. But this race is also about the balance of power under the Gold Dome. Democrats have a seven-seat hold on the House, and, this November, they want to flip three seats blue in the Senate, where Republicans hold a one-seat majority. The GOP views the District 5 seat as a pickup opportunity to bolster its majority, in part because Republicans outnumber Democrats here. In 2014, Donovan won by a relatively narrow 2.3 percent margin. But midterm elections are considered a referendum on the president’s party — and Donald Trump isn’t that popular in this district; Hillary Clinton bested him in 2016 by 5.5 percentage points. “It is an important race for us,” said Curry. Lund is a founding member of the Gunnison Basin Roundtable, which represents water users in the region. He also served on the Interbasin Compact Committee, a state advisory panel that discusses water compacts with states that share the Colorado River. He is cavalier about the drought in Colorado. He rattled off past dry years: 1935, 1977, 2002. 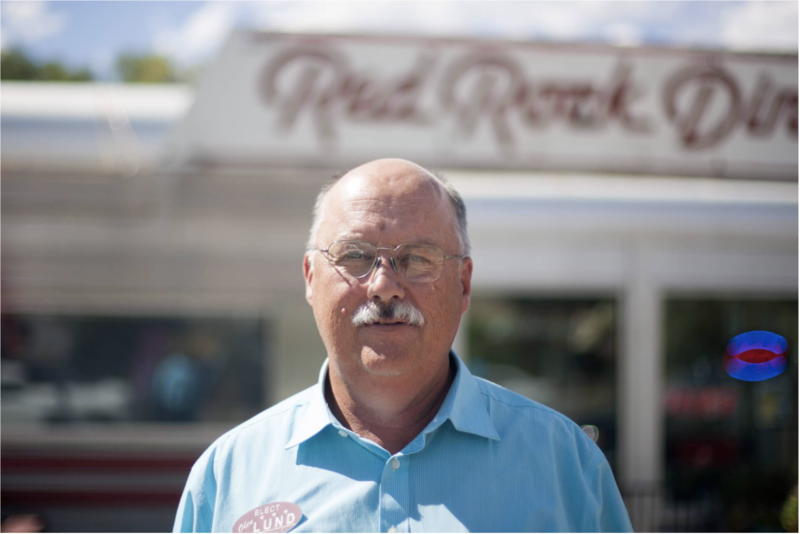 “It’s been dry before,” Lund said during an interview at the Red Rock Diner in Carbondale last week. Still, he said there is a looming collision between a growing population on the Front Range and demand from the thirsty Lower Basin states of Arizona, Nevada and California. The 1922 Colorado River Compact requires the Upper Basin states — Colorado, Wyoming, New Mexico and Utah — to send at least 7.5 million acre-feet per year to the Lower Basin. Farmers and ranchers must be efficient with their water, Lund said. One tool, alternative transfer mechanisms, or ATMs, allow farmers to lease their water rights for purposes other than irrigation. Still, he cautioned, there are inherent problems with ATMs and they must be applied on a case-by-case basis. As for new taxes to pay for conservation and efficiency projects, he scoffed. As he drinks a cup of ice water and eats a hamburger, he recalls growing up helping his neighbors grow vegetables and inheriting his father’s pear orchard before turning it into alfalfa pasture. Across the Continental Divide, the Arkansas River spills into the Chaffee Valley. Intermittent rafting outfits mark the sides of State Highway 24. 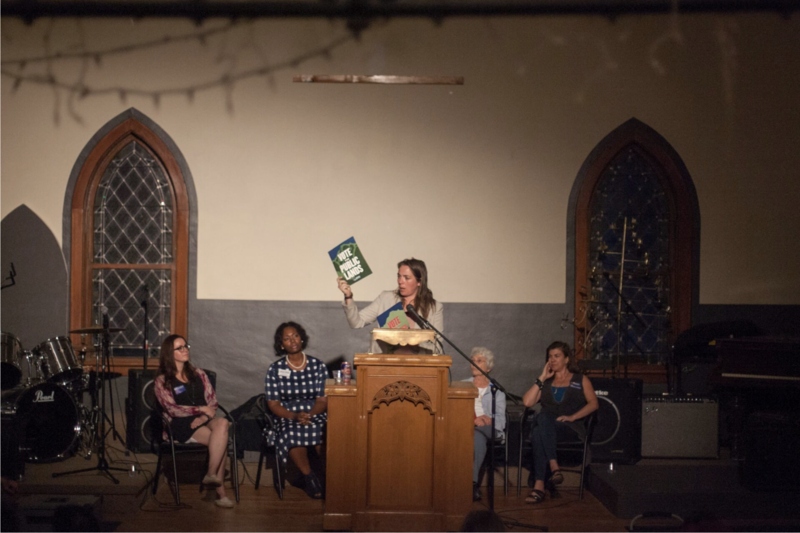 In Salida, a recreational tourism town which sits on the river, about 50 people gathered inside the A Church recently for a progressive candidate forum. Sen. Donovan drove down from Vail, where she runs her family ranch raising Highland cattle, chickens, horses and mules. She also grows vegetables. One of the people at the forum asked her what she plans to do about water shortages. Donovan said some farmers and ranchers fear they have to “use it or lose it,” referencing a Colorado water law clause that says if a farm uses less water than it’s entitled to, the owner’s allocation can be cut. She also said some farmers sell their water rights outright to municipalities, a process known as “buy and dry.” Farmers, she said, need more flexibility. She said she wants to look at new ideas for how farmers and ranchers can lease water rights to the Colorado Water Conservation Board to keep stream flows high for ecological purposes, like fish habitat, and recreational uses. “How do we give the agricultural community more options with their water rights while not likely losing them? I know the realities on the ground and I know the pressures the West Slope is going to feel,” she said in an interview with The Colorado Independent. Donovan opposes any new transmountain diversions. And damming more rivers requires more water, which there isn’t much of to begin with, she said. Besides, she said, it may be better to add capacity to existing reservoirs. She added there’s little the state legislature can do around this subject given that most dams require federal permits. When it comes to passing new taxes to pay for water conservation and efficiency projects, she’s open to ideas. In addition to water, audience members at the forum brought up the area’s lack of affordable housing. “My favorite barista told me he and his family are leaving because they can’t afford to live here,” said Anne Marie Holen, a resident of Salida. The lawmaker says she wants to give tax credits to local businesses that invest in housing. Spotty Internet service was another complaint. Donovan said a new law she co-sponsored will pump tens of millions of dollars into Internet infrastructure in rural Colorado. People applauded when Donovan said, “It’s not acceptable that a health care bill is more than a mortgage bill,” adding that she wants legislation to increase transparency around drug companies’ supply chains, an effort that was shot down in the Republican-controlled Senate this session. The Independent asked Lund for his thoughts on affordable housing, broadband and health care policy, but he was unable to respond in time for publication. Donovan raised more than $163,000 so far this election cycle. Coloradans for Fairness, an independent expenditure committee supporting Democrats in the state Senate, spent more than $30,800 on digital ads supporting her. There are virtually no limits on how much money IECs can accept and spend on candidates. Lund, by comparison, has raised only $14,000. But he has more generous support from several outside groups buying ads on his behalf, such as the Colorado Economic Leadership Fund, a 501(c)4 that does not have to disclose its donors or how much it’s spending on Lund’s campaign, and Americans for Prosperity, another dark money group backed by the Koch brothers. Furthermore, the Senate Majority Fund, an IEC that aims to elect Republicans to the state Senate, spent more than $69,000 this year on mailers attacking Donovan on behalf of Lund’s candidacy. Much of the Senate Majority Fund’s money comes from oil and gas companies. And Lund does not equivocate in his support for the industry. He supports drilling in his backyard, the North Fork Valley, where the Bureau of Land Management, under the Trump Administration, is proposing to lease land to drillers. Gov. John Hickenlooper opposes the plan, saying it could impact greater sage grouse habitat and affect big game winter range and migration corridors. Lund said recreation probably has a greater impact on the environment than drilling, citing a recent trip to Eagle where he said there were mountain bike trails were all over the mountainside. “That has got to be an interruption of something,” he said. Donovan not only sees things differently, she helped make the third Saturday in May “Public Lands Day.” Wilderness, wildlife and water are the reason people live in Colorado, she said. “They’re the pictures we put up on Instagram. And they fuel the economies of many communities,” Donovan told those attending the candidate forum. Donovan opposes drilling in the North Fork Valley. She said she sent letters to the BLM opposing the plan. “Your role as a public servant is to be a voice for the local community. And the local community that will be most impacted by that drilling does not want it,” she said. That community is Paonia, Lund’s hometown. For farm residents in rural Senate District 5, there is a concern that lawmakers in distant Denver are not listening. “We just don’t want them to forget about us,” said Paul Stockwell, executive director of the Delta Area Chamber of Commerce. But right now, these voters mean everything to the candidates as they tour the state, knocking doors and asking for support. The district’s roughly 35,600 unaffiliated voters, the largest bloc, matter most. Overall, the district’s population has grown since 2010, totaling about 143,000 people as of 2016, according to the U.S. Census. Donovan said her campaign has contacted over 17,000 people, either by phone or by knocking doors. Lund said he’s been out campaigning, too.